Unionville senior Courtney Smith entered her third year of XC with a resume that has been growing season-to-season. As a sophomore, she was 4th in AAA at Hershey. Then last year, she won her first state title, setting a meet and course record. In the winter, she broke the state record in the 3000 meter run, but had to settle for 2nd place. She more than made up for it by twice outsprinting the same competitor, first for 3rd place in the Girls 3000 Invitational at the Penn Relays, and then in the finals of the AAA 3200 meter run at the PIAA State Championships. Smith led her team to a qualifying spot and trip to NXN after winning the Northeast Regional. But in the first 1000 meters in Portland, she fell and was spiked. She recovered for 10th. Then during indoor, and despite an injury, Smith captured 3rd in an incredible 3000 at PTFCA Indoor States, and anchored her DMR to a state title. Two weeks later, she anchored that DMR to a 6th place finish in the New Balance Nationals Indoor champs in a time ten seconds better than their state title... and anchored the 4xmile the next day to a 3rd place finish - both earning all-American recognition. But the injury endured. She went through PT, and returned to racing at the Henderson Invitational on May 2nd. Beyond happy to be back. US#2 Unionville Girls and US#8 West Chester Henderson boys captured team titles at the Ches-Mont Champs. Unionville's Courtney Smith and West Chester East's Chris Cummings were individual titleists. 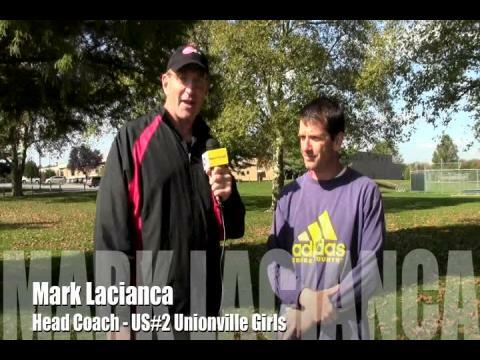 US#2 Unionville PA coach Mark Lacianca talks about the Ches-Mont champs and the upcoming championship season. Varsity Girls Race - won by Courtney Smith of Unionville in 18:00. Unionville #1 Courtney Smith repeated as Ches-Mont champ in 18:00. 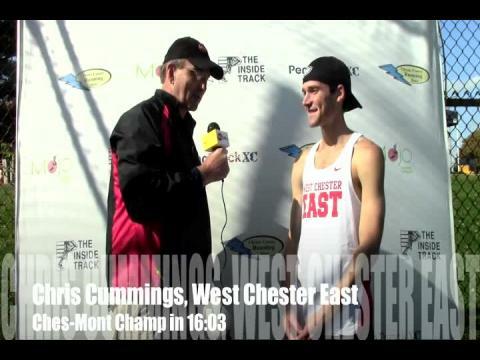 West Chester East SR Chris Cummings captured the tough Ches-Mont championship in 16:03.